HONOURED: Kenneth Baum (seated), his family and councillor Ron Nelson celebrate the unveiling of Baum Park. 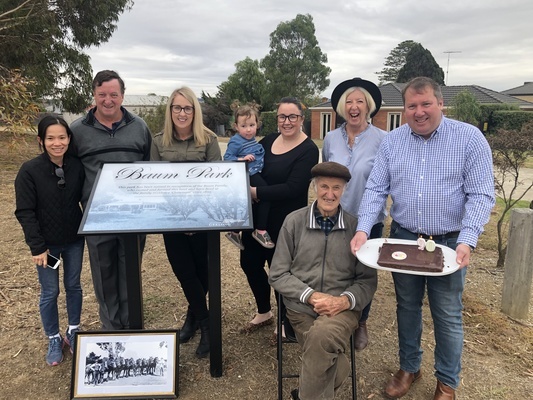 A Waurn Ponds park will honour a family who farmed the land for four generations before its subdivision. Kenneth Baum, who turned 90 on Sunday and still lives next to the park, was thrilled Geelong’s council had renamed it after his family. “Four generations of Baums have lived on this land and farmed it since the early 1890s,” he said. Mr Baum’s home and the park are part of the original property his family tended. “The land was fertile and crops, fruit and veggies thrived,” he said. His grandfather Gottfried Baum purchased the 245-acre (99 hectare) property, Claremont, in 1894 and the family farmed it for more than a century. From 2000 council subdivided most of the land for residential housing. The park, formerly The Vineyard Reserve, sits on the site of the farm’s original dam. Geelong’s council now owns and manages the 5300 square metre park, which features a playground. Local resident Bruce McDonald proposed renaming the park to honour its heritage and council unanimously approved the proposal last November. Councillor Ron Nelson officially unveiled Baum Park alongside the family on Saturday. “It was a pleasure to meet Mr Baum and members of his family to celebrate the renaming,” he said.